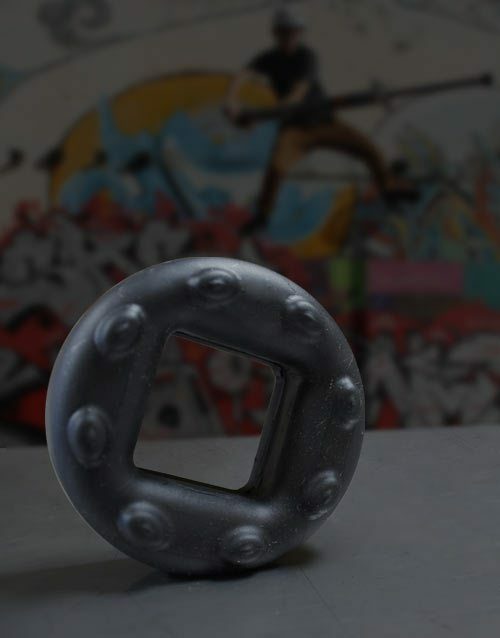 If you are doing lots of bouncing on your V2 or V3, and especially if you are doing flips, dismounts, grinds and stalls - chances are you'll need to replace your bushing eventually. 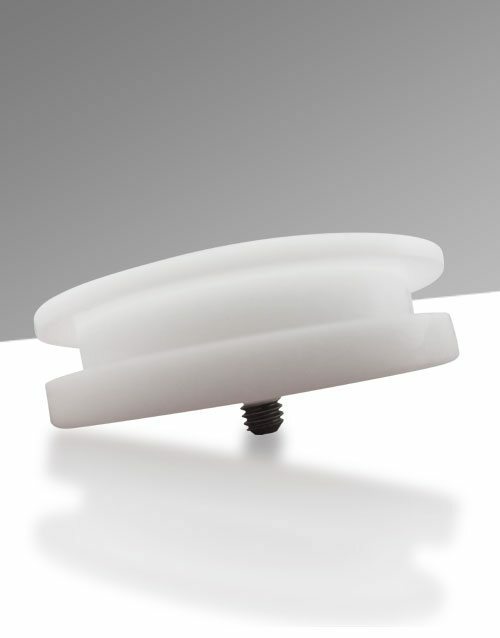 This snap-in plastic bushing is easy to replace and is built to last. Be sure to keep your shaft clean from nicks and dings - this will help ensure a long bushing lifespan. 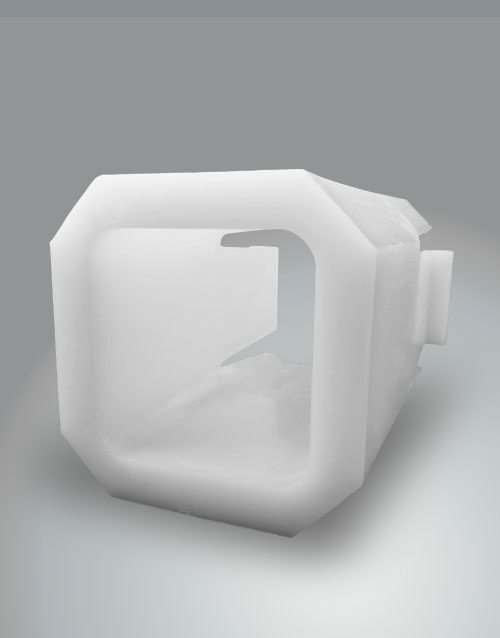 Warning This online replacement part fits V2 and V3 models only! Our Green Shield graphic tee was created for those who want to display their pride in being a part of creating the world's next bigtime extreme sport. Displayed proudly across the chest are two Vurtego sticks, which symbolize the V3 and V4 models, divided by the Vurtego name. We are the leader in extreme pogo. We wear our shirts with pride as we step into a new generation of low altitude personal flight. Slim Fit Shirts Our slim fit 4.5 oz. pre-shrunk jersey knit shirts are cut to fit your frame in just the right way. Made from 35% cotton / 65% polyester, these shirts are designed to display your bulging muscles to the world - just make sure you've got the strength to keep the ladies off! 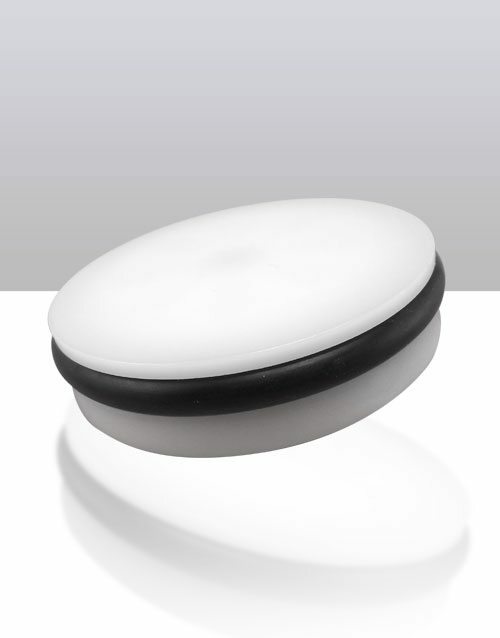 The slim fit design tends to run on the small end and will fit tight to your waist and arms. If you're unsure of your fit, it's always better to choose the larger size. No Feel Printing Our water-based silk screen prints are dyed into the fabric of this men's tight fit T-shirt so that you'll never feel a thing but our soft, wonderful cotton all over your body. No need to worry about crusty old paints ruining your perfectly soft t-shirt. Our Black Shield graphic tee was created for those who want to display their pride in being a part of creating the world's next bigtime extreme sport. Displayed proudly across the chest are two Vurtego sticks, which symbolize the V3 and V4 models, divided by the Vurtego name. We are the leader in extreme pogo. We wear our black graphic tees with pride as we step into a new generation of low altitude personal flight. Slim Fit Shirts Our slim fit 4.5 oz. pre-shrunk jersey knit shirts are cut to fit your frame in just the right way. Made from 100% cotton, this black logo tee is designed to display your bulging muscles to the world – just make sure you’ve got the strength to keep the ladies off! This men's slim fit shirt design tends to run on the small end and will fit tight to your waist and arms. If you're unsure of your fit, it's always better to choose the larger size. No Feel Printing Our water-based silk screen prints are dyed into the fabric of the shirt so that you'll never feel a thing but our soft, wonderful cotton all over your body. No need to worry about crusty old paints ruining your perfectly soft black t-shirt online. Our Aqua Robots shirt was designed for the playful at heart. Depicted on the shirt is a sequence of fun-loving, bouncy little aliens moving across your chest, throwing down a variety of different tricks. 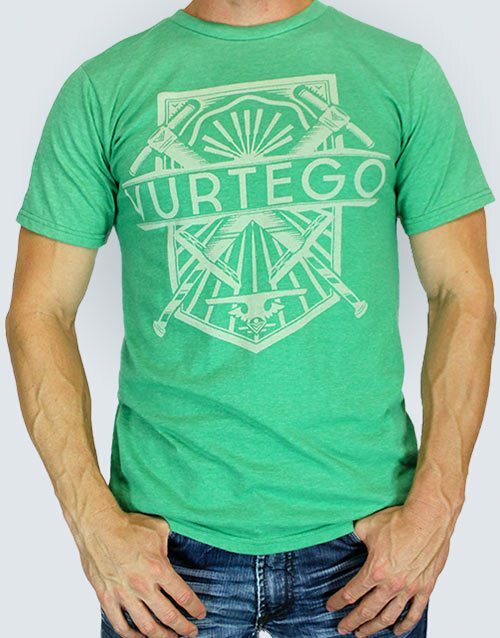 The bright, aqua fabric of this blue graphic tee online plays right into the fun spirit of the Vurtego culture and sets you apart from all those other lazy, video game playing peeps in the crowd. Slim Fit Shirts Our slim fit 4.5 oz. pre-shrunk jersey knit shirts are cut to fit your frame in just the right way. Made from 100% cotton, this shirt is designed to display your bulging muscles to the world - just make sure you've got the strength to keep the ladies off! The slim fit design tends to run on the small end and will fit tight to your waist and arms. If you're unsure of your fit, it's always better to choose the larger size. No Feel Printing Our water-based silk screen prints are dyed into the fabric of the robot shirt so that you'll never feel a thing but our soft, wonderful cotton all over your body. No need to worry about crusty old paints ruining your perfectly soft blue graphic tee. Our purple robot shirt was designed for the playful at heart. Depicted on the shirt is a sequence of fun-loving, bouncy little aliens moving across your chest, throwing down a variety of different tricks. The purple fabric of this branded slim fit shirt plays right into the fun spirit of the Vurtego culture and sets you apart from all those other lazy, video game playing peeps in the crowd. Slim Fit Shirts Our slim fit 4.5 oz. pre-shrunk jersey knit shirts are cut to fit your frame in just the right way. Made from 35% cotton / 65% polyester, these robot shirts are designed to display your bulging muscles to the world - just make sure you've got the strength to keep the ladies off! The slim fit design tends to run on the small end and will fit tight to your waist and arms. If you're unsure of your fit, it's always better to choose the larger size. No Feel Printing Our water-based silk screen prints are dyed into the fabric of the shirt so that you'll never feel a thing but our soft, wonderful cotton all over your body. No need to worry about crusty old paints ruining your perfectly soft t-shirt. 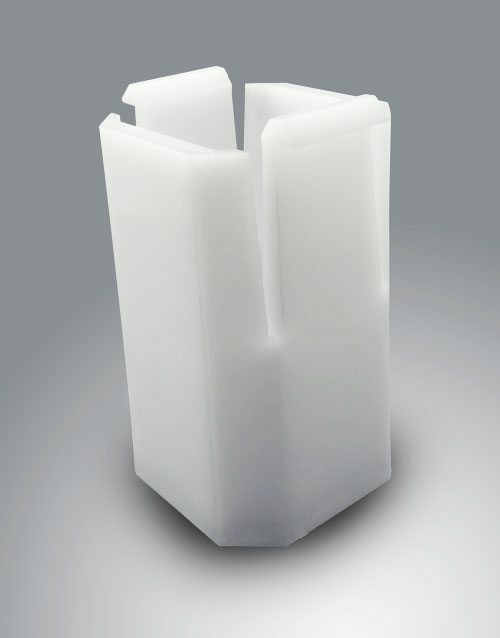 Under strict supervision, our nylon pistons are injection molded to within .003" for maximum air sealing. 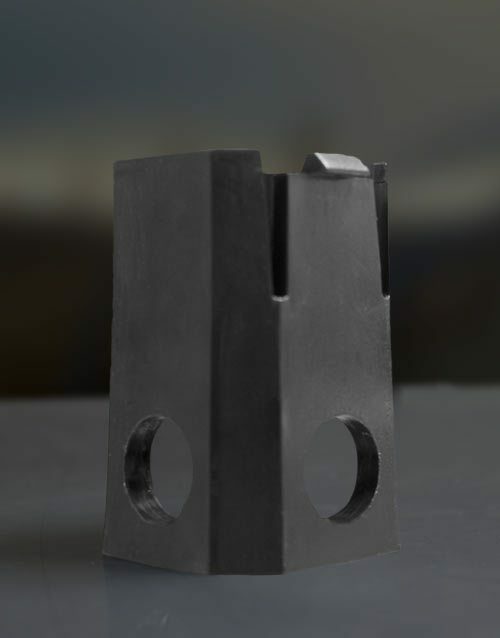 And if your nylon piston is already working perfectly (as it should be), you can always buy one of these bad boys to toss around in the backyard. Their hollowed out underside makes them a perfect new-age frisbee! 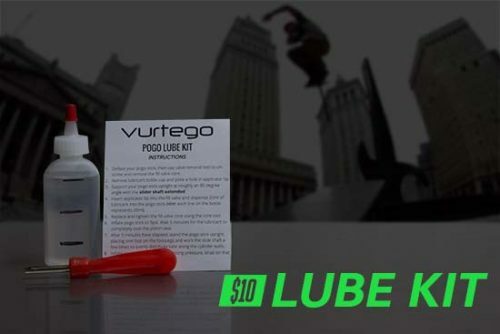 Order this piston replacement from Vurtego today. 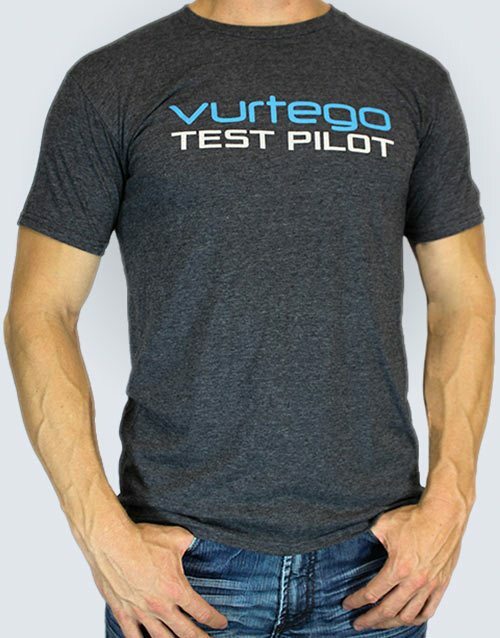 The Test Pilot T-shirt will show off your flight capabilities to the world. Not many people can say they're a test pilot for low altitude flight products, but with your Vurtego pogo stick, you certainly can! Slim Fit Shirts Our slim fit 4.5 oz. pre-shrunk jersey knit tees are cut to fit your frame in just the right way. Made from 35% cotton / 65% polyester, these shirts are designed to display your bulging muscles to the world - just make sure you've got the strength to keep the ladies off! The slim fit tee design tends to run on the small end and will fit tight to your waist and arms. If you're unsure of your fit, it's always better to choose the larger size. No Feel Printing Our water-based silk screen prints are dyed into the fabric of this athletic fit shirt so that you'll never feel a thing but our soft, wonderful cotton all over your body. No need to worry about crusty old paints ruining your perfectly soft t-shirt.